Editing a video in 2018 can’t get easier, with the latest technology and the new super duper video capturing devices like Action Cameras, DSLR etc. the quality of videos we make has gone far better. Still, you should always edit a video if you want to impress someone. And if you are looking to become a professional video editor, then starting out with following tools will make the process quick and easy. In this article, you will find twenty-seven best video editing software (free and paid) that let you edit videos with the help of your computer. Do check the section of frequently asked questions at the bottom of this page and find out the common queries and I hope this article will provide you with ample information about video editing. Another thing to note before moving into the list of software is understanding your needs and wants. If you plan to make simple videos, then there are plenty of free video editing software and you don’t need to buy anything for it. But if you plan to earn from your videos from platforms like YouTube, then you should buy video editing software that fulfils your needs. You get all sort of different options in the software below, so just go through each of them and decide what software you would require as per your plans and wants. You don’t have to pay a higher cost if you are not planning to make it that big. The software in the list are very renowned and being used by millions of users. So, take a cup of coffee and go through everything we have in this article. You will be able to create amazing videos in minutes! It has creation modes that ensure you spend less time learning and more time creating. Effects like – Transition, Animated titles, PiP objects, Particle Effects, Color presets and much more are present to help make your videos quickly and easily. Supported formats and codecs include MOV, MKV, H.264, FLAC and many more. PowerDirector 15 has significantly improved video performance when working with the popular WMV format, as well as adding FLAC audio editing support. Adobe Premiere is the most sophisticated, user-friendly and feature-rich video editor that is also cross-platform, and it has a huge number of output format choices for your convenience. All the things you need every day are covered with new features like audio remix, haze removal, video collage, enhanced face detection and adjustment layers focus. For Windows 10 users you also get the touch-friendly interface that is complemented with the good old Organizer app to keep photo, videos etc. in a more searchable organized fashion. Adobe’s Premiere Pro CC enables you to make visually stunning videos from virtually anywhere. With the industry-leading video production toolset, you can work across desktop and devices to edit virtually any media in its native format and create professional productions with brilliant color for film, TV, and web. The new version CC is the most powerful Premiere Pro yet. Premiere Pro is part of Creative Cloud, and it comes with Adobe CreativeSync, so your assets are always at your fingertips right when you need them. CreativeSync powers your Libraries, and it connects your mobile and desktop apps to get your files wherever you need. And read my detailed review and why I consider this as the best video editing software in 2017. FCP or Final Cut Pro is a premium software developed by Apple Inc. for Mac computers. I have started using this recently and until now it is the most efficient tool I have ever used. It has tons of features that no other software possess. The intuitive interface and timeline features are just perfect for post-production. In version 10.3, which is the latest at the time of writing it has got some powerful set of features that have been introduced recently. The best of them all is the timeline color coding, where you can see different colors for timeline objects. Customized window layouts to suit your style. Easy to follow workflow with color coding and magnetic timeline. Support for RAW videos and Rec. 2020 wide colour space. Accelerated rendering to watch the preview in real time. Timecode effect to check which footage was used. A new browser for content and media surfing. Instantly remove any effects and attributes added previously and much much more. Surely the best video editing software for Mac lovers and do read the review below for extra information on Final Cut Pro X. Make your most engaging movies ever with VideoStudio Pro X10. Smart new features take routine editing tasks out of your way, freeing you to explore exciting new creative options. New Audio Ducking automatically detects audio and narration to keep foreground and background sound balanced. Helpful features make it easier to manage clips, combine projects, and re-use custom filters and transitions. Get creative with new overlay objects, Video Masking, Freeze Frame and bonus effects from NewBlue. Access 6 weeks of free training from StudioBacklot.tv to get started quickly and learn about advanced editing techniques. With proven 64-bit performance and support for multiple formats, including new XAVC S, Video Studio Pro X10 makes it fast and fun to create movies you’ll love to share. Even beginners can easily remove unwanted scenes from videos or add incredible effects, transitions, and suitable music to turn raw video footage into movies that will impress any viewer. Comprehensive support for the latest camcorders and faster video import makes Magix Movie Edit Pro a favorite for may. It also contains resolutions up to 4K for truly enjoyable editing. Create impressive videos in a flash with brand new title templates and proDAD Mercalli V2 for image stabilization. Accurate editing down to the frame, 32 tracks, and an intuitive user interface let you stay one step ahead. Export your movies to DVD, Blu-ray Disc, mobile devices, YouTube and Facebook. EDIUS Pro 9 is among the best nonlinear video editing software that we have tested, and it has proven itself on various parameters. It provides a wide range of support and offers a whole range of editing options for different audio, video etc. formats. It has a fast as well as a flexible user interface that includes an unlimited amount of audio, title, video as well as graphics track. It provides an entire spectrum of editing features for creating some of the best appearance and appealing output for captivating the audience. Make your most interesting and exciting movies ever with the new Multi-Camera Editor in Pinnacle Studio 20. View and edit footage from 2 cameras, and align clips automatically with Audio Syncing. See results faster with 64-bit power, support for Intel’s 6th Generation processor (Skylake), and enhanced HD processing and playback performance. Add style with 1,500+ 2D/3D effects and choose the perfect sounds and music from the ScoreFitter library. Share your movie directly to Facebook, YouTube, and Vimeo, on the latest devices, or enjoy an easy authoring experience with Pinnacle MyDVD. With its ability to simply import photos and videos from almost any device; edit with the aid of cutting, text, image, and sound effects; create DVDs, AVCHD, and Blu-ray™ Discs; and play back and stream images – Nero Video 2017 is the powerful all-rounder for your next movie project. Nero Video 2017 offers a full range of tools for top image quality for your discs and files as well as dazzling 4D effects. Full-HD video edit previews, a choice between single or double monitor setup, and automated use of project settings – can making movies get any easier? Trim, cut, split, merge, rotate, mix videos. Apply effects and overlays, insert menus, audio, texts, and subtitles. Burn DVD/Blu-ray discs. AVS Video Editor supports all key video formats. Edit & save video files in AVI, VOB, MP4, DVD, WMV, 3GP, MOV, MKV, H.263/H.264 codecs, etc. Transfer video from DVR, web or VHS-cameras and save the video on hard drive or burn DVD discs. Or record media files from your PC screen and create video guides, training videos or demos. Share Your Video by uploading newly made video files to all popular video hostings such as Facebook, Flickr, MySpace, etc., directly from AVS Video Editor interface. Lightworks is EditShare Academy and Emmy award-winning, professional Non-Linear Editing (NLE) software supporting resolutions up to 4K as well as video in SD and HD formats. In the last 25 years, Lightworks has been used to edit some of the finest films in cinema history: The Wolf of Wall Street, LA Confidential, Pulp Fiction, Heat, Road to Perdition, Hugo, The King’s Speech and many more! We’re proud of its heritage, and we want to share it with you. Discover the incredible features of this application and why Oscar-nominated editors around the world use Lightworks Pro every day. Another best video editing software that I love due to ease of use especially for beginners. (formerly Sony Vegas Movie Studio) Smartphones make it easy to make movies and Sony Movie Studio makes it even simpler to make those movies stand out. With a streamlined workflow, powerful editing tools, and a vast array of video and audio effects, the art of moviemaking is right at your fingertips. Add titles and music. Add color correction and transitions. Movie Studio offers all the tools and features you’ll need to put your masterpiece together, fast. Movie Studio is touch-enabled for touch PCs, which means that using a mouse to drag and drop clips to the timeline is a thing of the past! Make edits, add transitions and effects, and record a voiceover – all with the touch of a finger. Use Filmora video editor to express your creativity and amaze with beautiful results. Cut, edit, merge and trim clips. Add music and text. Apply special effects. Get a professional-looking movie in minutes. Share with any social media sites like Facebook, Vimeo, YouTube. A nice choice for beginners in video editing. The interface is quite simple and intuitive. 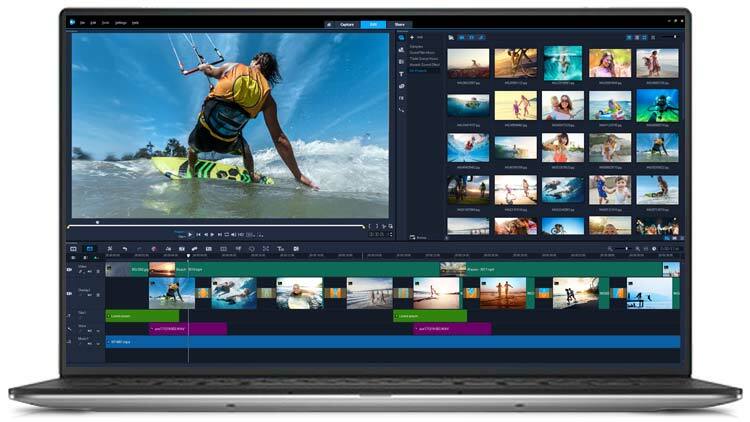 This is the entry level video editing software for your Mac that can turn your photos and footage into a brilliant production in no time, plus it now supports the 4k video. Its comes free with Mac and you download it from the Mac App Store. PROS – Simple interface, good themes and color matching option to make movies look smoother and consistent. Good solid chroma-keying functionality, with enough audio tools and a theatre features that allow you to share movies with your other Apple gadgets and gear. CONS – Limit of two video tracks, missing of few controls like tagging, motion tracking and multi-cam capabilities. It doesn’t have all the tools but for basic video editing like putting together clips and images for good-looking movies, it provides a lot of support and appeal. iPhone movies can be easily imported and you can make a good impression by adding few effects. Beginners should go for this, before moving to anything flashy on Mac. Although Windows Movie Maker is now not supported by Microsoft anymore and on January 2017, everything was removed from their website, Still you will be able to access the old archives via Wayback machine in the download link above. It was the best free video editing software for many years in the past. Windows Movie Maker was perfect at a time as it had tons of things within for a home video editing enthusiasts. My first movie with me friends was edited on Windows Movie Maker I thoroughly loved the interface back then, it was simple and easy to grasp. You had the options of Import/Edit slideshows and videos. To make a movie with Movie Maker, you’ll need some photos and videos on your PC. Import photos and videos from your phone or another device to get started. Trim it, split it, speed it up or slow it down, you can also choose a theme to express your unique style. Bring your movie to life with a soundtrack that you can edit yourself. When your movie’s done, publish it to the web so you can share it with family and friends. So, if you still go the old Windows, then you can use the Windows Movie Maker by clicking the Start button, point to All Programs, point to Accessories, and then click Windows Movie Maker. Lightworks Free version is considered to the best free video editing software by TechRadar.com and rightly so, it has a number of features available in free version and all the basic video editing can be done in a proper way. The major difference are listed here. Lightworks is not very easy to use at first, but once you start using it more often you will see how it can be customized to user preference. Another good about this software is that its multi platform, be it on a Mac, PC or a Linux machine it will run smoothly on all. HitFilm 4 Express has all the great cinematic, stylish abilities and interface. You have good resources on their website to learn this software, as it will take time for beginners to get the look and feel. The free version is actually pretty good and has 1080 HD capabilities with 8-bit pixel depth. You also got the 180+ effects and presets to play with your editing tricks. The graphic editor of HitFilm is pretty good as well, many other software can’t match the quality of editing and tools within. You get almost 10 premium effects packs in the free version and chroma key with extraction tools at disposal. Rightly referred to as the best place to start filmmaking. DaVinci Resolve 12.5 is said to be the best advanced editing plus the color grading toolset for user that need to work with SD, HD & UHD projects. For beginners that want to get intense with video editing in future, this software will give them a good boost. Their website features all the advanced features their pro version supports and if you want to take it to the next level, the hardware provided is absolutely amazing. You will definitely want to look what’s inside this heavyweight video editing suite. Its a free, cross-platform video editors that is also open source. It came to linux at first and slowly it got converted in Windows and Mac. It supports video up to a resolution of 4k and has a wide variety of format that can be imported for video editing. The interface before was hard to figure out, but it has improved a lot and you can feel the sleek and intuitiveness in the interface in the current version. Definitely a worth spending time on. Upload to YouTube – save your login credentials to upload videos directly to YouTube, Facebook or Flickr from VideoPad. Wax is a high performance and flexible video compositing and special effects software. The idea for Wax is to be a very general purpose and flexible in video compositing and effects so that you can compose your dream video sequence with ease every time. Wax can create 2D & 3D special effects and can work in two modes – as a standalone application which would appeal for home users/beginners, and as a “plug-in” to video editors/NLEs which would be more useful for professional editors. Currently, Wax can work as a plug-in with Sony Vegas®, Pure Motion EditStudio and Adobe Premiere® and work for integrating with various other NLEs is in progress. A free video editor to cut, filter, and encode projects. Avidemux is a free, open source cross-platform video editor for Microsoft Windows, Linux, Mac OS X, and BSD. It is written in C++, and you can use it for various tasks such as encoding (convert videos from one format to another), cutting (cut certain portions from a recording) or filtering (resize, deinterlacing, add subtitles, color correction, etc.). Has built-in support for many popular codecs and files: AVI, MP4, ASF, DVD, MPEG, MKV. It is one of the best free video editors whenever you need to automate video processing or editing process. The software is released under the GNU GPL license and has been released (binaries) in both 32-bit and 64-bit versions. Blender supports all major operating systems and its a GNU licensed program that enables you to make 3D content. Some of its features include advanced modelling, animation tools, character animation, node-based material. Its works pretty well on all platforms – Windows and Mac. ZS4 Video editor is another good software that is free and it can easily combine clips, trim, add sounds and many good effects that video editor needs. Althought the interface is not that attractive, but you can sure do the basic stuff and export your files in multiple outputs. One more software that is open source and has been in the market from a long time. The total downloads of this software have crossed 3 millions. Being an open source content creation platform it provides sevral benefits like media management, playback, compositing, editing, animation and special effects that can make your video look fantastic. Video editing software that are free and open source, do have some elements that you can’t ignore. Movica is a simple UI based video editor that lets you join files, split movies, select or delete portions, copy-paste and fine tune selections etc. It is an open source project and it runs on Windows XP with .net framework and it also requires Windows Media player. So, if you are still using Windows XP and haven’t upgraded somehow then Movica can do the trick for you. HyperEngine-AV is licensed under GNU GPLv2 which means its free and open source. Its an award winning video editing software that previously was paid. Video editing features like capture, arrange and process video, editing of audio and text, creating movies, slideshows, trackless document and much more can be achieved in this software. VirtualDub has a fast linear operation over video and it has a good number of capabilities for batch operations that can also be extended with third party filters. It doesn’t process files other than AVI as it was meant to be used with AVI only. For MPEG-I it will be able to read it, but it will not be write in this file format. The development of VirtualDub has stopped and the developer has done the last update in late 2013. So, if you want to do basic editing for videos and need a free software in your Windows PC then you can still use it. Otherwise, you have plenty of more video editors. Do let us know, if you have used any of the software above, your thoughts and comments are welcome below. How do you edit a video on your computer? To edit a video on your computer, first, you would require a video clip. Let’s assume you have a new video in your mobile phone that you recently shot. Open that video in video editing software from above. Usually, you will need to connect a wire from your mobile phone to you computer and transfer the video. Some of the video editors allow you to directly transfer a video from mobile device to their software. Once your video is inside your video editor, you then need to see the timeline or storyboard. You can edit your video, cut a particular section or anything in between. For each software, the options may be different but concepts are same. You will have options to add transition effects, titles and credits, audio or music in the background. After editing your video you can export it in multiple formats, a few video editors will allow you to upload video directly to sites like YouTube, Facebook etc. Which free software is best for video editing? By trying almost every other video editing software I would consider CyberLink PowerDirector the best one out of the lot. Its easy to use, affordable for beginners and it doesn’t have a steep learning curve and you will enjoy their video editing interface. But it does have a pro version and hence the free version will export a video with a watermark of their logo. Still, if you want to try before you buy, then this software has all the guns and whistles for pro video editing. What is the best video editing software for YouTube? Adobe’s Premier Pro is one such software that need no introduction. People rely on them and they have all kind of resources like support and detailed video tutorials for using their software. The trust factor always play in when you are buying a software, so my advice would be to take their trial for a month and then decide what to do. YouTube videos made by professionals and millions of follower base channel heads have time and again mentioned Adobe for the supreme quality and stability. What kind of editing software do YouTubers use? Again Final Cut Pro & Adobe Premier Pro is the software YouTubers use in all kind of computers, laptops be it on Windows or Mac. Its a bit costly but worthy enough to be mentioned as the best video editing software for YouTube. How do you edit a video for YouTube? If you have a decent internet speed at your location, then YouTube video editor is the best online video editor one could have. It has all the necessary features like Transitions, Trimming, Controlling Video speed plus many more essentials that video editors require everyday. How do you edit videos on Windows? Windows Movie maker is pre-installed software that comes together with Windows 7, 8 and 10. So, editing videos on Windows gets easier with their native application that is the Movie maker. Can I use iMovie on my PC? No, PC with Windows installed doesn’t have iMovie software as Apple hasn’t made a Windows platform support for their native video editor. People with Windows can use the Windows Movie maker to edit videos for free on their PC. This concludes of our long article on video editing. If you have any questions, suggestion or feedbacks do let us know by commenting below. You wrote about 20+ video editors and missed Bolide Movie Creator. How it is possible? It is really lightweight, easy to use, cheap, but powerful. Great choice for the beginners. Will try it .. if its worthy enough will list it as well. It should have been mentioned that a single user license for DaVinci Resolve is free. This is also the best software application for students who later want to work in the film/video industry as it is designed for use by teams of editors working on a large project. Having issues with Windows Movie Maker (Windows 10). Doesnt accept high quality files, too much compression, video quality is greatly reduced. Looking for a software for surgical video editing (Usually HD & big files). Preferably free, if possible. If the requirement is once or twice within a month that use Adobe Premiere PRO CC that will cost only $20. The third option can be Flimora which is paid, but has all the features you need in affordable pricing. In this recently updated post, we re going to look at 11 of the best video apps and software for 2017 that will cover all your video editing needs, along with some best social video practices. This is an amazing post by the author. i like this too much. i am Aditya and my aim also to become a good blogger like you.